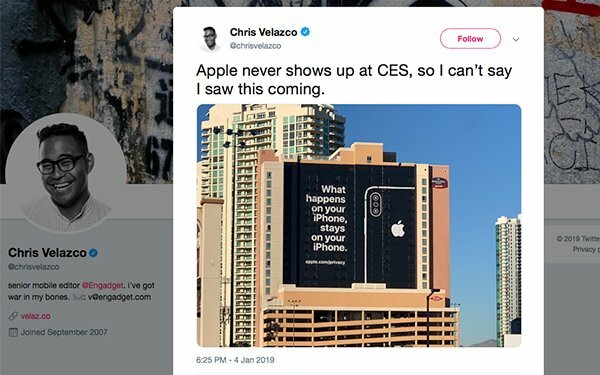 One of the biggest digital companies surfaced a message on the side of a high-rise building in Las Vegas just in time for CES 2019, the biggest electronics show in the U.S. The message stands about 13 floors high on the side of a hotel that overlooks the Las Vegas Convention Center hosting CES 2019 this week. It reads "What happens on your iPhone, stays on your iPhone" and includes a URL that leads to Apple’s privacy pages. That URL helps people to search online for information related to Apple's privacy details. Apple demonstrated that message clearly after the U.S. Justice Department tried to force the company to help it unlock the iPhone used by a shooter of the San Bernardino terrorist attack in 2016. Apple refused, and the department had to find their own way in. Let's face it. Data aggregated by smartphones, desktop computers, smartwatches, virtual assistants and other inanimate objects connected through IP addresses to the internet can provide a detailed profile of likes, dislikes, and habits such as where someone bought their last coffee or the time it took to run a mile. The message on the side of the Vegas building makes a play on the slogan "What happens in Vegas, stays in Vegas," created by advertising company R&R Partners for the Las Vegas Convention and Visitors Authority. While the ad makes a jab at Google, Facebook, and other digital and electronics companies that fail when it comes to consumer privacy, Apple wants to make clear that the company will keep private the data collected through Apple Pay, Face ID, and the health data aggregated by the Apple Watch. Digital ads are common. And while attending CES gives attendees insight into the future of the digital world, the onslaught of messages through technology in the moment becomes overwhelming. A giant billboard is the easy way to reach a local mass market.